SNBS recognized for exceptional consulting services and implementation of Deltek Vision. Stambaugh Ness Business Solutions (SNBS) announces its inclusion on Accounting Today’s 2015 list of top 100 value-added resellers (VAR). The Top 100 Value-Added Resellers are chosen from organizations specializing in the sale and implementation of Enterprise Resource Planning (ERP) and accounting software. This year’s list provides a deep look into the successful strategies used by the technology consultants and resellers on this ranking. Additionally, this year’s discuss their recent challenges, changing client expectations, and the impact the cloud is having on all businesses. The selection is based on annual revenue generated by each reseller. 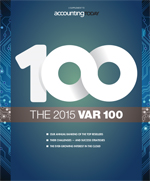 A special report that includes names of the organizations selected for this year’s Top 100 list, ranked by revenue, is downloadable at http://www.accountingtoday.com. Accounting Today is a trade magazine servicing the public accounting profession in the United States. The parent company of Accounting Today is SourceMedia, the publisher of more than 30 periodical brands including several major financial magazines.